Posted on Sun, Apr 8, 2012 : 7:36 p.m.
Michigan freshman shortstop Dylan Delaney makes contact against Michigan State on Sunday at Ray Fisher Stadium. A pair of runs in the top of the 13th inning allowed the Michigan State baseball team to avoid an Easter weekend sweep by Michigan. The Spartans’ Jimmy Pickens and John Martinez had RBIs in the top of the 13th and Tony Wieber completed his 3 1/3 of scoreless relief to earn the win. Both teams used five pitchers during the game. Wieber was the only one to not allow a run. The Spartans tied the game at 8-8 in the top of the ninth inning after loading the bases against Matt Ogden on a single, walk and hit-by-pitch. A second hit batter scored Justin Scanlon, who started the rally with a one-out single. Both teams’ starting pitchers had short outings. Michigan’s Ben Ballantine left in the top of the second inning when the Spartans took a 3-0 lead on a Ryan Jones single. Michigan State’s Mike Theodore didn’t make it out of the second inning, either, removed one batter after Michigan’s Zach Zott tied the score with a three-run triple. Coley Crank, who went 3-for-5 with four RBIs, had a three-run single in the bottom of sixth inning to give the Wolverines a 7-5 lead. 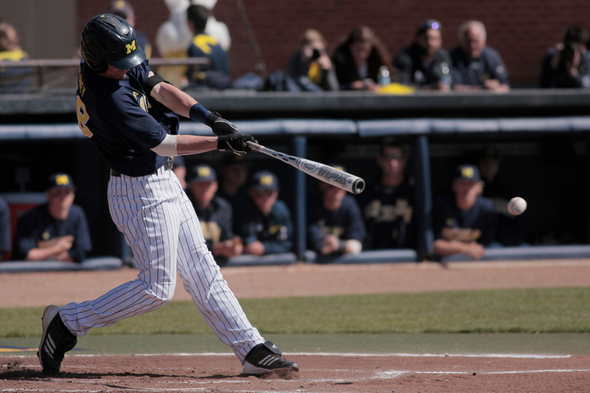 Brett Winger was also 3-for-5 for Michigan (15-17, 2-4 Big Ten), which won the first two games of the series by 4-0 and 4-3 scores. Jones went 4-for-5 with two RBIs for the Spartans (19-10, 3-3).